The northern province of Hoa Binh has declared no more cases of African swine fever (ASF), becoming the first locality among 23 cities and provinces affected nationwide to get free from ASF. Addressing the ceremony held in Luong Son district on April 9, Deputy Minister of Agriculture and Rural Development Phung Duc Tien said Hoa Binh passed the duration of 30 days since its last ASF-infected animals culled and has found no more new cases so it is eligible to declare free from ASF. 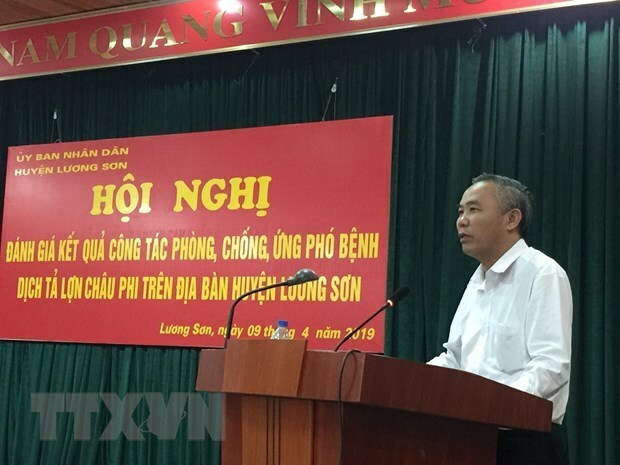 The quick control of ASF outbreak in Hoa Binh is attributed to the prompt direction of the Government, the Prime Minister and the Ministry of Agriculture and Rural Development and other competent agencies, he said. Hoa Binh’s departments and competent agencies will keep a close eye on the implementation of preventive measures to prevent the disease from coming back. On March 6, the Luong Son district’s People’s Committee reported the first ASF cases in Ho Thanh commune and then Thanh Luong commune. The functional agencies zoned off the affected areas, monitored the transportation of pigs and pig products in and out of the areas, disinfected vehicles going out from the areas, and kept a close eye on the slaughter and sale of pigs and pork products. Bac Kan province is expected to become the second locality to declare ASF free on April 10. According to the World Organisation for Animal Health (OIE), African swine fever is a fatal infectious disease caused by a virus which spreads rapidly among pigs.